The Gretsch G5422TDCG Electromatic is a Double-cutaway hollowbody electric guitar that gets the unmistakable Gretsch twang. Incredibly affordable, yet laden with professional features, the G5422TDCG Electromatic Double-cutaway hollowbody boasts vintage-voiced Gretsch "Black Top" humbucking pickups, an Adjusto-matic bridge, and a Bigsby B60 tailpiece for the subtle pitch modulation that has become synonymous with Gretsch. Three-way pickup switching and four controls, including a master volume, ensure you'll have no problem conjuring the legendary tones the G5422TDCG hollowbody was built for. 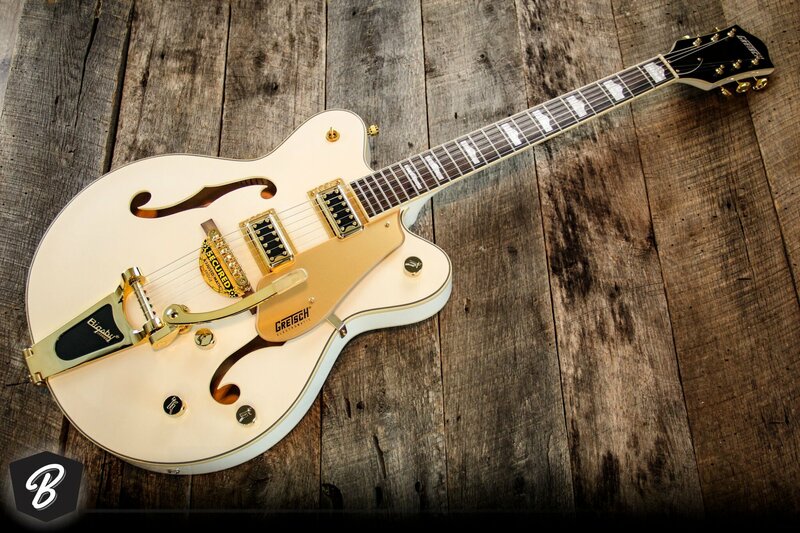 The Gretsch G5422TDCG Electromatic allows you to pull off a lot of tonal tricks. Volume controls for each pickup help you create a perfect balance between warmth, bite, and brilliance when both pickups are engaged. The master tone control lets you fine-tune your sound once you've got the pickups dialed in. And thanks to the master volume control, you can take your tube amp from clean to growling without changing the balance between your pickups. And of course you'll get sweet tone from the neck and bridge pickups individually.